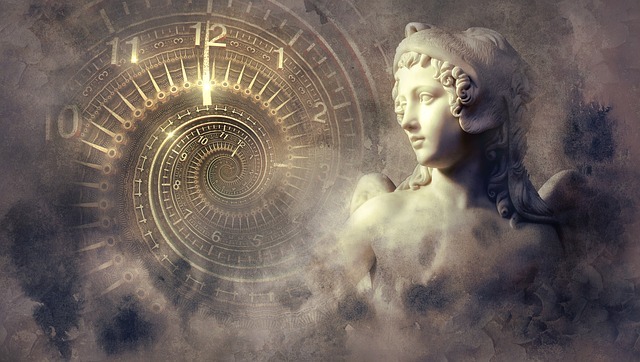 Home Numerology Angel Number Meanings Triple Digit Angel Numbers Meanings Angel Number 222 Meanings – Why Are You Seeing 2:22? Have you been going about life as normal but keep seeing the repeating number sequence 222 everywhere? You think to yourself, what could this mean? Maybe this is more than just coincidence! Seeing the triple numbers 222 constantly could be a sign from your Angel guides. The Angels often choose to communicate to us through Numerology, if there is something important we need to know about! Keep reading for the Angel Number 222 meanings and why you are seeing 2:22! What Does Numerology Number 2 Mean? Angels often communicate through the use of numbers. Luckily, we have been able to decipher the Angelic messages we receive through meditation and Numerology. 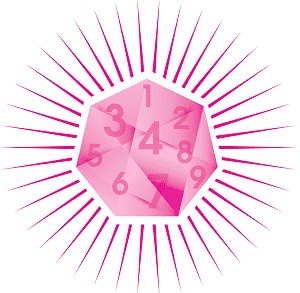 Numerology is the sacred study of numbers; used for divination and other spiritual purposes. Below you will find some possibilities for why you keep seeing Angel Number 222! Angels choose to communicate through the Numbers because they are simple, clear, and realistic aspects we encounter throughout our daily life. We are more likely to pay attention to something we can actually see! This is why seeing Angel Number 222 may stand out to you so clearly. 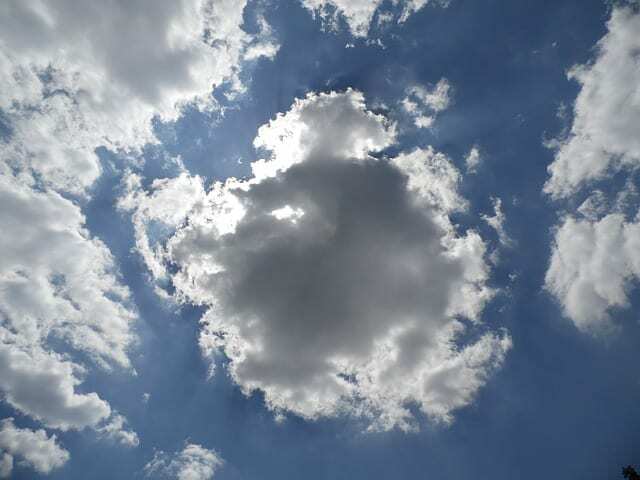 When you start to see Angel Numbers, frequently in triple digit form such as 444 or 555, this is direct communication with the Divine taking place! By exploring the meaning behind each Number’s meaning in Numerology we can dive further in with the use of Angel Numbers. The power of that single digit is tripled in the case of Angel Number 222. In order to understand Angel Number 222 we need to first look at what 2 means within the context of Numerology. This number is a very interesting Number, holding significance in systems such as Tarot, Astrology, and spirituality. It is often associated with relationships, marriage, love, and balance. The Number 2 represents a major life choice that must be made. Often finding a middle ground can be difficult or next to impossible. This number is letting you know a decision must be made and you will most likely need to choose one thing over another. In your search for balance the Number 2 can be a great ally! 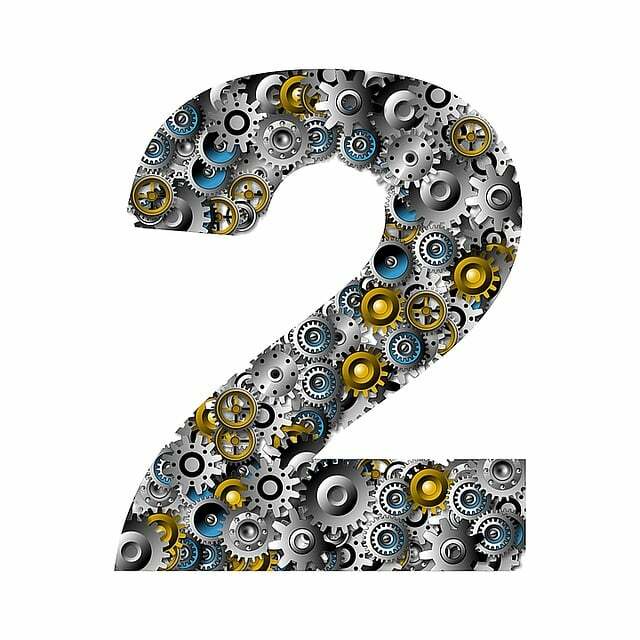 In Numerology, the Number 2, also relates to marriage, partnerships, and relationships. This is because many relationships are between 2 people. For example, you may have one business partner, a best friend, or one lover. When 2 individuals come together to make a pair you are now working on brining awareness to each person’s side of things. A relationship balancing act usually ensues between the two people. This can take time as each person in the partnership needs to make space for the other person. Finding harmony, peace, and unity are all aspects of the Number 2. Getting to this place often requires intense self-reflection and realization. 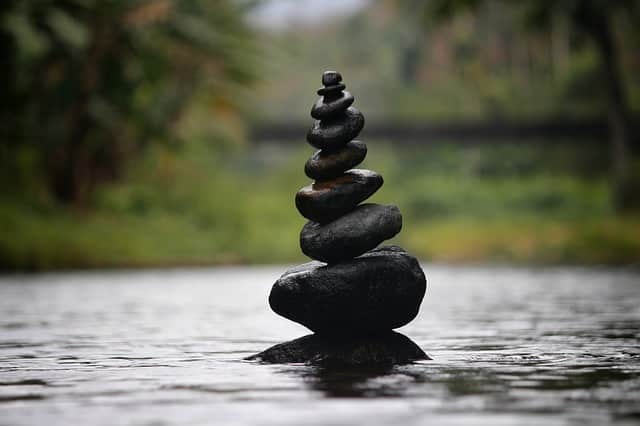 In the search for balance, you must become mindful of the part you play within your partnerships. Number 2 can represent having to make a choice between two ideas, places, or people that you love intensely. It is letting you know that many choices are not obvious or easy; but are what helps you grow spiritually as a person. Keep reading for the meanings of Angel Number 222 and possibilities why you are seeing this number! These repeating number 222 messages you are receiving is not just by chance. The meaning of seeing these spirit numbers is your Angel guides trying to get your attention. The Angel Numbers 222 or 2:22 are being put directly in your path because the Angels have a message for you! When you start to see this triple number sequence that is your wake up call to pay attention. By opening yourself up to these synchronistic events you will begin to have more and more of them. You will start to notice that all the signs link up, uncanny experiences start to feel like an everyday occurrence. This indicates that you are vibrating with the frequency of the Angels. They know you are paying attention and will give you more and more signs indicative of the information they want you to be aware of. Keep your eyes, ears, and heart open to what this message might be! Take note of what you were doing or thinking at the time you saw Angel Number 222 for further insight. Below you will find the 5 possible meanings for why you keep seeing Angel Number 222! The challenge behind the symbolic communication that Angels choose to use is that we need to interpret the meaning! Divine beings do not typically give you word for word instructions or write stuff out, that would be too easy of course. Instead, we are tasked with using our intuition to guide us to the meaning of the Angel Number 222. Do you seek guidance and insights into the past, present and future, with regards to relationships, love, or money? 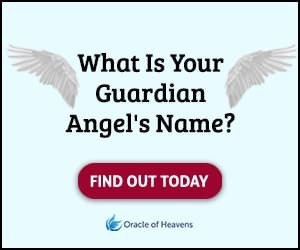 Before we discuss the possible meanings for seeing Angel Number 222, take this popular free test to see whether your Guardian Angel is trying to send you an urgent message. 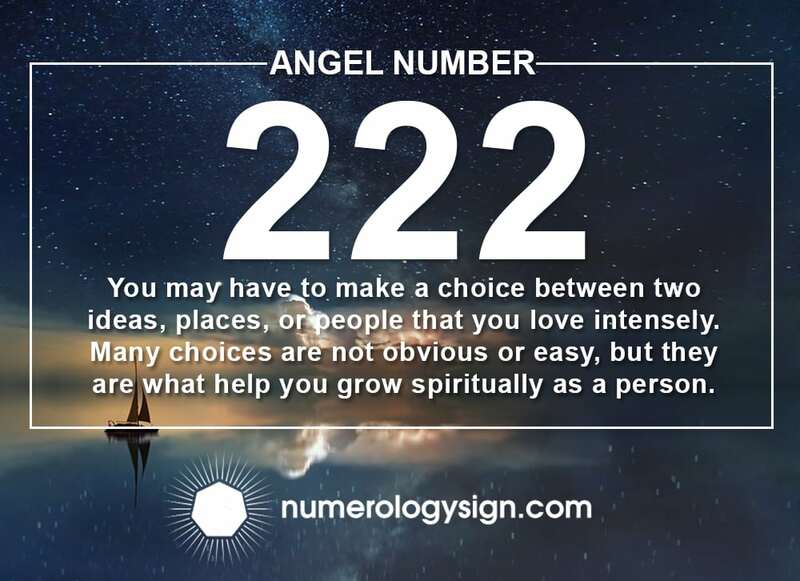 Seeing Angel Number 222 is often symbolic of going through a rough patch in which you need to make a difficult choice. When this number comes into your life it is your Angel guides reminding you they are here to help. Maybe you have been trying to decide if leaving a relationship is the right move for you. Or maybe you have been struggling with quitting your job to pursue a particular dream. The Angels are urging you at this time to make a decision! Staying in a situation that is not healthy or serving your highest good or purpose can hurt you in the long run. The universe does not want you to suffer. Angel Number 222 entering into your consciousness is a direct message that now is the time to make a decision! The Angels can help you develop your intuition so you will know which path is best for you to take. You can meditate, hold onto a crystal for clarity, or pull some tarot cards to give you further information into the situation at hand. The key here is to bring awareness to how you feel about either choice. Follow this Angelic guidance you are receiving in order to live out your life purpose more fully. In contrast to the Angel Number 444, when you see the Angel Number 222 this means you should be seeking out advice! The reason the Angels gave you this sign is because they know you need another person’s point of view. 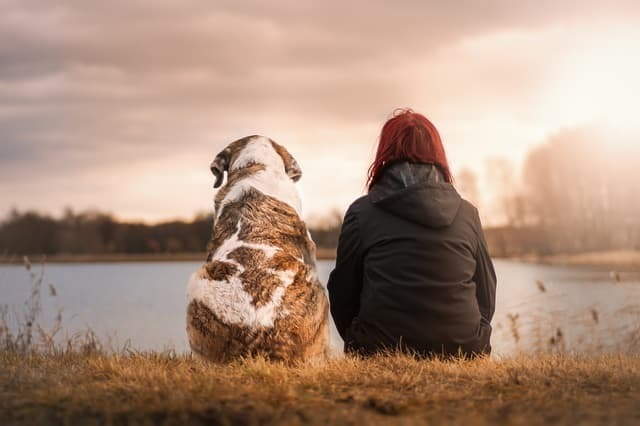 Getting several or even just one trusted friend’s point of view on something can be invaluable to sorting out what to do or how you are feeling. Sometimes speaking to a counselor or therapist, close friend, or romantic partner is the sounding board you need! The Angels also respond well to questions. 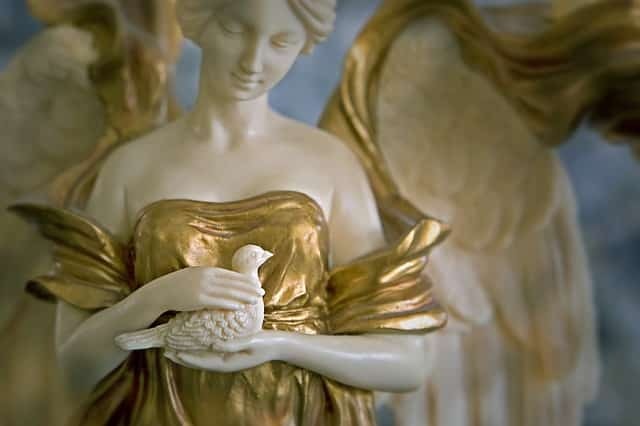 If you ask your Angel guides for advice they are likely to provide it to you in the way of symbols and dream messages. Angel Number 222 is your signal that you do not need to do anything alone. 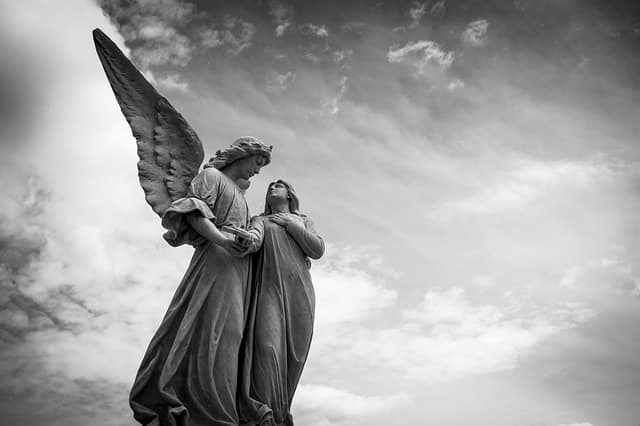 Your Angels are by your side to help you find the answers you need. Pay attention to what develops in your life the weeks following seeing Angel Number 222. This could be a clue as to what the Angels want you to know! If you feel your judgement has been clouded by being emotionally wrapped up in a situation then this is a good indicator it is time to seek out some advice. The Angels recognized you needed extra help, for this reason, they showed you triple Angel Number 222. Friends are an important aspect of life. Having a good friend to bounce ideas off of, discuss your relationship difficulties with, and just for companionship are very helpful to your spiritual growth. Spending time with others is a reminder that not everything is about us! This is one of the lessons of seeing Angel Number 222. This spirit number entered into your life to let you know that a new friend will be appearing soon. Be open to befriend people who have your best interests in mind. The reason you have been seeing Angel Number 222 is that the Angels recognize you are lonely and need a friend. With love, the Angels are letting you know they see what you are going through and are here to help! Your Angel guides understand that you need a friend in order to feel complete at this time. You are searching for balance and harmony in your life and know having a good friend to share your time with can help you achieve this. The meaning behind Angel Number 222 is to express to you the importance of love. The number represents opposition and if you have been oppositional to allowing love into your life the Angels have taken note! Angelic beings vibrate through the frequency of love. They know that you have denied this powerful force in your life. The reason you are running into Angel Number 222 is that it is time for you to open up to new love. You may have closed yourself off to love for fear of getting hurt, not being able to get along with a spouse, or a hard break-up you went through recently. At this time there is a romantic partner waiting for you to be open to the possibility and energy of love. Your Angel guides are assisting you in realizing that in order to experience love you have to open up to vulnerability. You have to be more in tune with your romantic feelings and desires. The Angels have given you repeating number 222 as a direct message that this is the time to allow love into your life. Finding a balanced, peaceful relationship is possible! There is a need for you to release control when you see Angel Number 222. The last meaning Angel Number 222 may be crossing your path so frequently is that you are being given new spiritual insights! The Angels see that you have been working hard to understand compromise, take care of others, and respect and honor yourself. Your Angel guides are showing you that the next step in your spiritual life purpose is on the horizon. You are being given valuable information at this time. Pay very close attention to your dreams, imagination, and thought patterns. This will give you an idea of what new ideas are being sparked within you! The reason you are seeing Angel Number 222 is that in order to receive new insights you needed to bring your spiritual life into balance. Your Angels are supporting you in developing your intuition, and ultimately to trust your own inner voice. Angel Number 222 Meanings - Why Are You Seeing 2:22? Have you been seeing the repeating number sequence 222 everywhere? Keep reading for the Angel Number 222 meanings and why you are seeing 2:22! I couldnt have seen this at a betther time!!! This is what I needed to know. Blessings for all. I m so Happy my angels are with.me.. Many of my questions, now I will have the answers. 👼 👼 👼.